Smoked Beers: History, Brewing Techniques, Recipes was written by Ray Daniels (of Designing Great Beers fame) and Geoffrey Larson (the founder/president of Alaskan Brewing). It covers the use of smoked malt in brewing, concentrating on the German tradition (it is the strongest), but also taking a look at the use of smoke in American beers as well as throughout history. Content: The first (long) chapter covers the history of smoked beers. The authors argue that up until the invention of coak dried pale malt a couple hundred years ago most malts (and thus most beers) were brown and smokey (there were some places that used either straw or air to dry malt to make for cleaner beers). This chapter also talks about events in beer history like the switch away from brown malt to pale plus black patent in porters (mainly because pale malt gives better extraction). Finally it covers some historic smoked beers (Gratzer, Lichtenhainer). The second chapter covers some of the notable producers of smoked beers. Schlenkerla (the maker of several sausagey brews) and Spezial both smoke their own malt, while most other German brewers buy rauchmalt from Weyermann (which is also available to homebrewers). Schlenkerla gets their consistency from blending 12 batches of malt in each silo, drawing from 2 silos per brew, and blending 6 brews into a single lagering tank. Alaskan Smoked Porter was created because a salmon smokery is located across the street (once a year the brewers use the facility to smoke malt over alder wood). Peat smoked malt (which I just used for the first time in an Adambier) is covered last, they mention multiple phenols levels being available, but I have never seen that at homebrew stores. The third chapter covers commercial examples of beers with smoked malt. The first part discusses the different rauchbiers made in Bamburg, many of which are not available in the states. The rest of the chapter gives short profiles of American smoked beers, ranging from smoke forward like Alaskan Smoked Porter to those that just have a smoke complexity like Arcadia London Porter. Quite a few of the breweries have gone out of business in the last 10 years (Brewmoon, DeGroen's etc...). There is lots of good information on each beer if you are looking to do a clone or just learn what makes a commercial beer taste the way it does (type of smoked malt, other malts, hops, ABV/SRM/IBU/OG etc...). I used the information here to help me when I was making my Alderwood Smoked Porter. The next chapter covers the chemistry of smoke. This there is some pretty interesting stuff even if you just like barbecuing . The temperature of the burning wood has more of an impact on the flavor than I realized (of course flames bad, but different compounds are produced at different temps). There are also some carcinogens created unless the smoking is well controlled, filtered, and burned with sulfur (this is one advantage of buying commercial smoked malt). Avoiding chlorine (and even chloride) is important as all the phenols in smoke make chlorophenols even more of a concern than usual. The fifth chapter covers smoking your own malt at home. This is something I have not tried, but there is loads of information on three different methods ranging from simple to complex. Smoking over a kettle grill with charcoal and wood on the opposite side from the malt sounds like what most people would do (unless you own a smoker). The sixth chapter covers the recipes. The appendix has a nice section of cooking with smoked beer (which includes recipes from several of the breweries covered in the book). The recipes range from the plausible like sauerbraten meatballs to the more fanciful like smoked porter cheesecake. The appendix also has as an outdated list of brewers who make smoked beers, as well as wood suppliers, and a metric-standard conversion chart. Recipes: Ten recipes that cover the wide range of smoked beer possibilities. Recipes include a classic Bamberg Rauchbier, smoked weizen, and smoked mild. Extract (although a mini-mash is generally required for smoked malts) and all-grain versions of each are included. I have not brewed any of the recipes, but I did not notice any obvious mistakes (like many of these books seem to have). Accuracy: It seems like an accurate book to me, no issues that I have spotted. Readability: Very easy to read, with lots of interesting information (assuming you like smoked beers). I think the organization is well done, and there are plenty of pictures/insets to keep the pages from being bland. I could have used more practical information and less history, but that is my taste in brewing books. 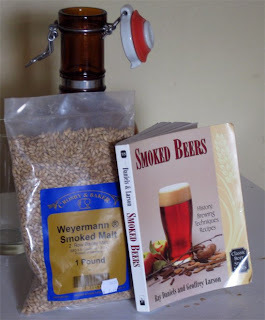 Overall: If you are interested in making smoked beers, and particularly if you want to smoke your own malts, this is a must read. The commercial info is a bit outdated, but other than that Smoked Beers does not seem nine years old. That said, there are some new smoked malts on the market, for example Briess has recently started selling some smoked malts, has anyone tried those? Good review! This is a book that I really enjoy because I really enjoy smoked beers, have been to Schlenkerla brewery in Bamberg, awesome beers, intense, but awesome. I made the Ein Hauch von Rauch, I am just about to keg it. I think I will try a couple more of the recipes later on this year. I tried the Briess smoked malt at CBC. Extremely strong, harsh, phenolic smokey flavor; closer in intensity to peat malt than Weyermanns smoke malt. Just tried some Laphroaig whisky tonight. Not too bad, maybe I'll give peated malt another shot.